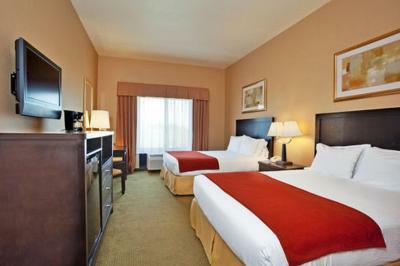 Lock in a great price for Holiday Inn Express Hotel & Suites Goodland – rated 9 by recent guests! There was a refrigerator, a microwave, a coffee pot, beds weren't too bad. Girl checking us in was extremely nice, very pleasant! Facility appeared fairly new and clean. Staff was friendly and helpful suggesting a restaurant. comfortable beds. GREAT front desk staff. shower head a little light with regard to water pressure, but overall a great stay! The hotel staff were very accommodating. However, we booked a king size room and received a room with 2 beds. They asked who we booked through and when we told them. They said Booking.com only tells them larger room or something and we weren't the first. They put us in king room, but handicap accessible. I was exhaustd when I arrived at Holiday Inn. Finding such wonderul staff and clean and comfortable accommodations was a major relief. The next morning i awoke to a great hot breakfast. This is a woderful place to stay at a reasonable price. 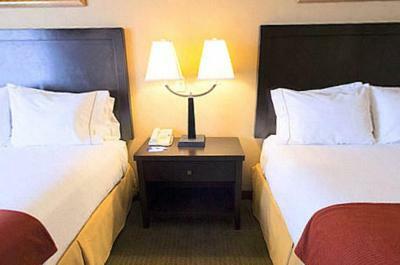 Holiday Inn Express Hotel & Suites Goodland This rating is a reflection of how the property compares to the industry standard when it comes to price, facilities and services available. It's based on a self-evaluation by the property. Use this rating to help choose your stay! This hotel features an indoor pool, hot tub and fitness center. Located 2 miles from High Plains Museum, it has spacious accommodations with a 32-inch flat-screen cable TV and free Wi-Fi. A fridge and coffee-making facilities are provided in the warmly decorated rooms, studios and suites at Holiday Inn Express Hotel & Suites Goodland. They also have in-room movies and a desk. Guests can enjoy a daily breakfast buffet featuring scrambled eggs or omelets, bacon or sausage and cinnamon rolls. 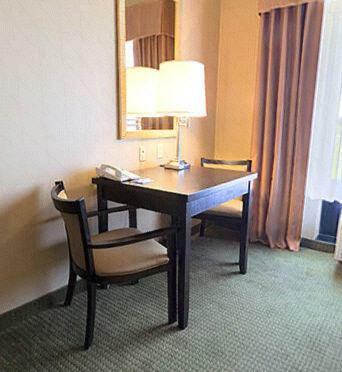 Goodland Holiday Inn provides free daily newspapers and a business center. 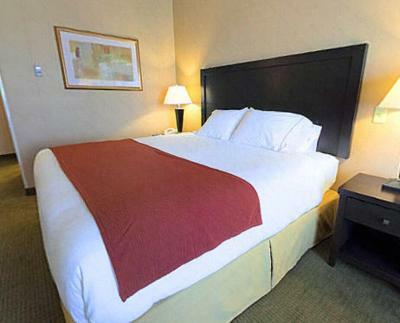 Located just off of Interstate 70, this hotel is 2 miles from Steever Park and 4 miles from Sugar Hills Golf Club. This property also has one of the top-rated locations in Goodland! Guests are happier about it compared to other properties in the area. When would you like to stay at Holiday Inn Express Hotel & Suites Goodland? 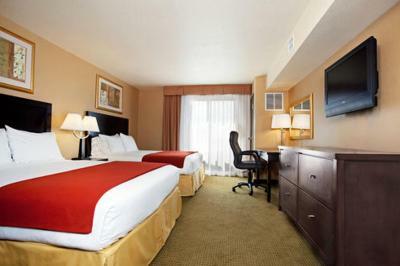 This room features a 32-inch flat-screen cable TV with in-room movies, free Wi-Fi and a fridge. Bed type preferences are subject to availability and cannot be guaranteed. This room offers a 32-inch flat-screen cable TV with in-room movies, free Wi-Fi and a fridge. This spacious studio includes a sofa bed, microwave and kitchenware. It also has a 32-inch flat-screen cable TV with in-room movies, free Wi-Fi and a fridge. This spacious suite features a living room with a sofa bed, a microwave and kitchenware. It also has a 32-inch flat-screen cable TV with in-room movies, free Wi-Fi and a fridge. 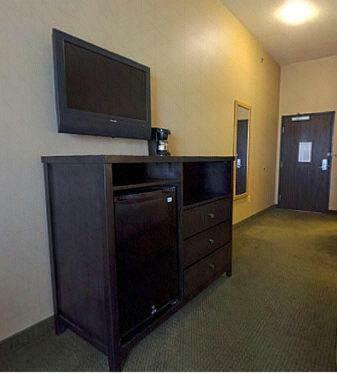 Offering free Wi-Fi and cable TV, this room includes a visual alert system and wide doorways for accessibility. 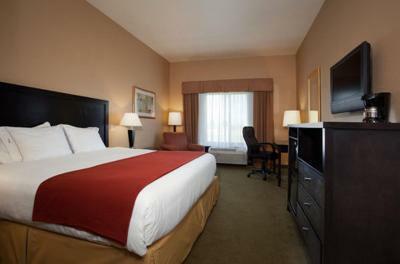 Offering free Wi-Fi and 32-inch cable TV, this room includes a visual alert system and wide doorways for accessibility. A microwave and a refrigerator are provided. House Rules Holiday Inn Express Hotel & Suites Goodland takes special requests – add in the next step! Holiday Inn Express Hotel &amp; Suites Goodland accepts these cards and reserves the right to temporarily hold an amount prior to arrival. Holiday Inn Express Hotel & Suites Goodland accepts these cards and reserves the right to temporarily hold an amount prior to arrival. Sour milk at breakfast, horrible pillows, had requested king room had to fight with them to get king room as through booking.com it was non-guaranteed and they assigned a double queen. I had to pay an extra $10 per night at the hotel for them to change the room type and even after offering to pay more initially they still made the change difficult. The shower was horrible. Just sprayed all over the place and the lighting in the bathroom was very poor. Seems we always request a king and it gets confirmed via Booking.com but always get a lesser room like 2 beds. Wish TV coverage was better and Holiday InnExpress would offer better Directv channels. Morning front desk girl not nice. Beds were worn and springy. 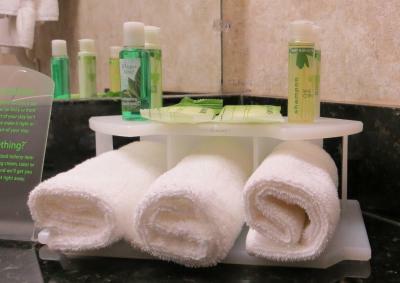 We didn't like the handicapped room due to lack of counter space in bathroom and room arrrangement. Since the hotel was doing us a "favor" putting us in king room, we didn't complain. Maybe communication between hotel and booking.com should be reviewed. Customer shouldn't be put in the middle. There was a refrigerator in our room that sounded like an aircraft carrier. When I told the front desk they said they would tell maintenance. We did not sleep, and there was no offer of compensation.